Capacity Any1/2 gal.2 gal.3 gal.4 gal.7 gal. 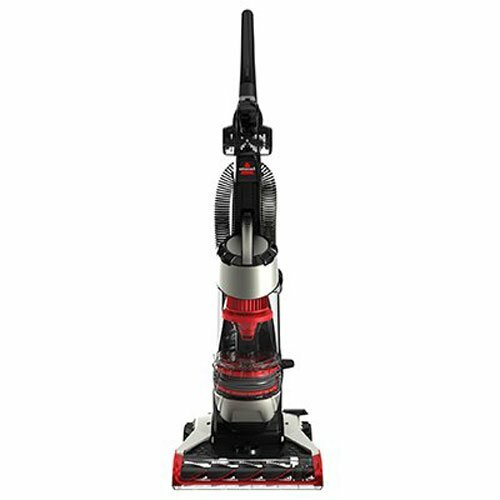 • 8lb Commercial Upright vacuum, switch in handle, Hypo allergenic outer bag, filtration rate to 99.387%, promote better health. 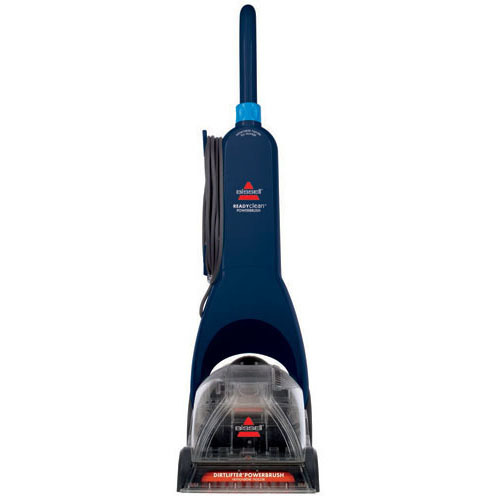 • Used to clean thousands of retail stores, hotels, hospitals and offices. • Helping Hand® Handle virtually eliminates squeezing of the hand, bending and twisting of the wrist. • Ingenious top-fill, hypo-allergenic design is twice as powerful as previous models and has up to 40% longer life. 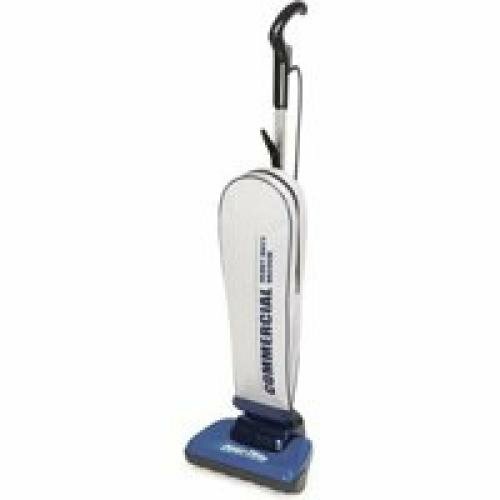 • Cleans under copy machines, drink dispensers, clothes racks, file cabinets and moves easily from carpet to hard floors with no adjustments. • Weighs only 8 lbs. • One year commercial warranty. 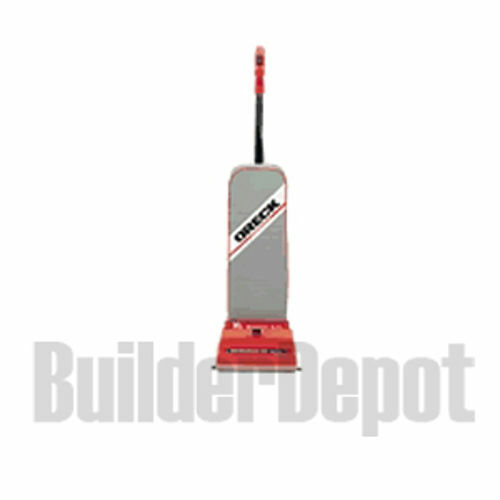 • 8lb Commercial Upright vacuum, red base, switch in handle, 35 foot cord. • ne year commercial warranty. 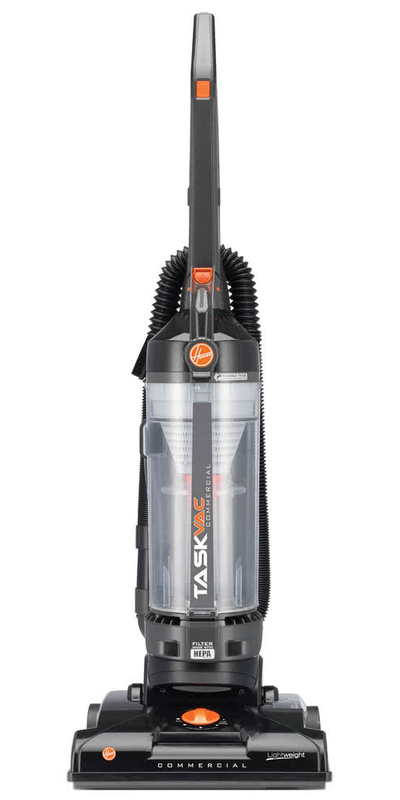 Cleans Up Close To Cabinets and Baseboards. 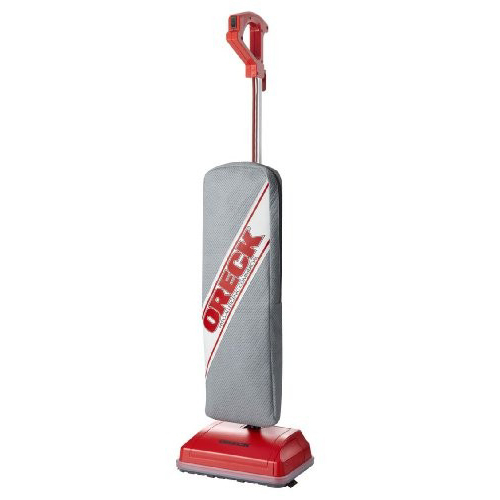 Moves Easily From Carpet To Hard Surfaces with No Adjustments. Weighs Only 8 Lbs. Includes On/Off Switch and A 35' Power Cord. 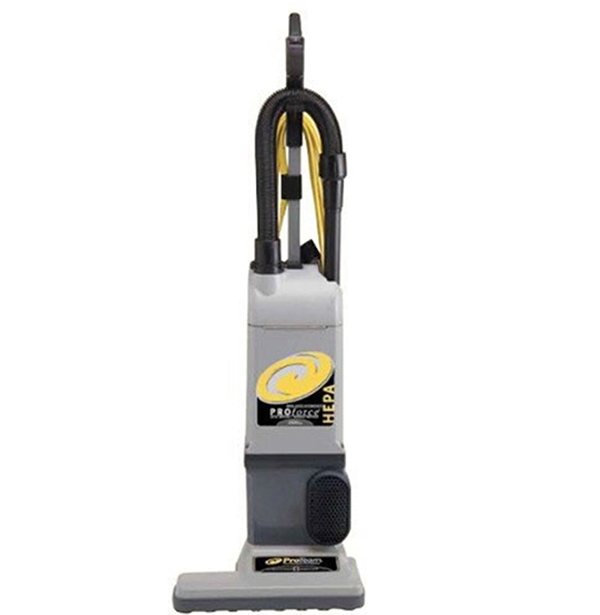 Take on challenging commercial cleaning with powerful direct suction and easy-to-use fingertip controls. Clear, non-marring bumpers and soft wheels allow you to clean without damage to furniture or flooring. 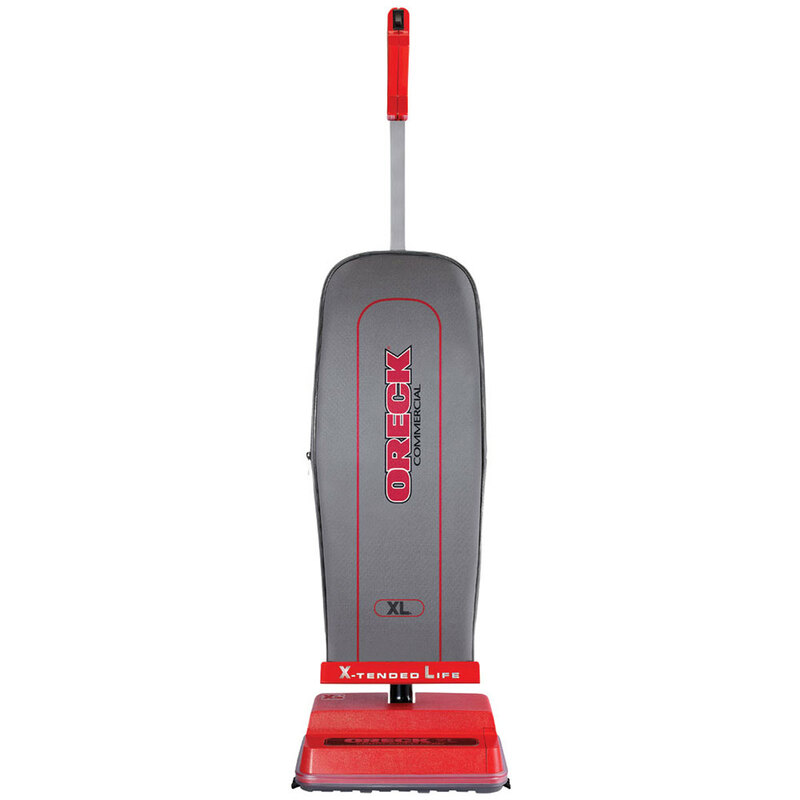 Low profile design, for cleaning up close to cabinets, baseboards and under desks and furniture. And at only 9 pounds, it's easy to push and carry anywhere. High speed roller brush, reaches speeds of 5,000 - 6,500 RPMs, depending on the surface. Current: 4 amp; Voltage: 120 V; Color(s): Gray/Blue; Weight: 9 lbs. 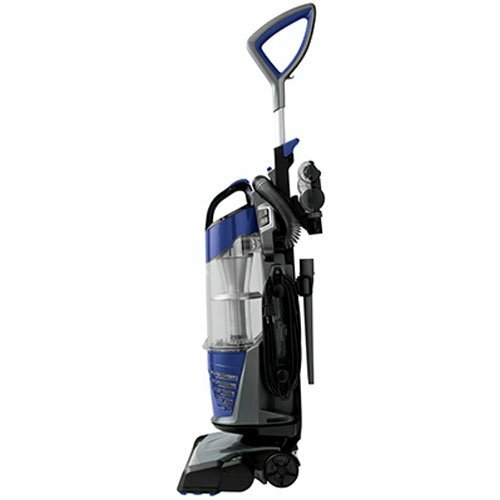 New design U2000RB commercial upright vacuum. Weights only 8 pounds. New features include Cog V-Belt with Cog Motor and brush pulley, 5 year warranty on belt, RPM circuit breaker which shuts off motor when brush roller RPMs slow down. 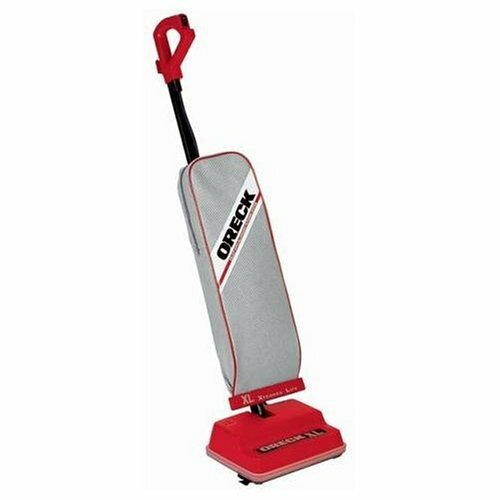 Unit includes a 12" wide cleaning head that covers a wider area and leaves no center dirt path, clear, non-marring bumpers, exclusive MicroSweep� that goes from carpet to bare floors without adjustments. 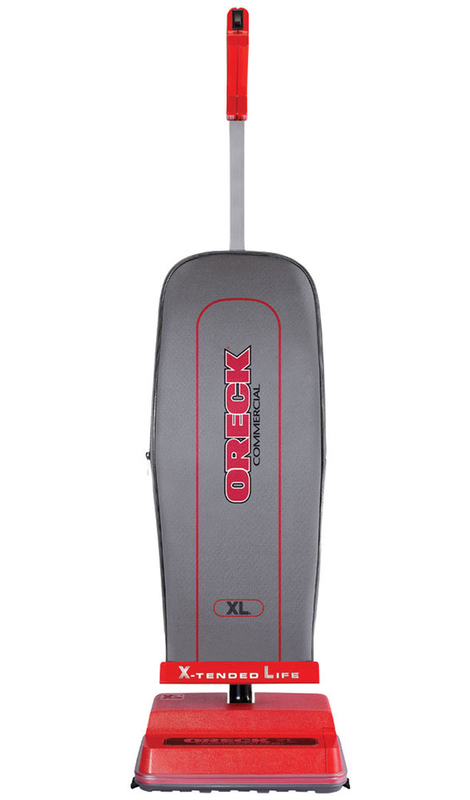 It also includes a cord guard which prevents cord damage, soft wheels that protect wood floors, fingertip-controlled on/off switch, and Oreck's exclusive Helping Hand� Handle that drops down flat for cleaning under low furniture and makes for easy storage. The ingenious top-fill design keeps power at the maximum even while the bag fills. It contains powerful, high-speed, balanced, double helix brushes that whirl at 6500 RPM. Comes with a one-year commercial warranty and a five year warranty on the belt. 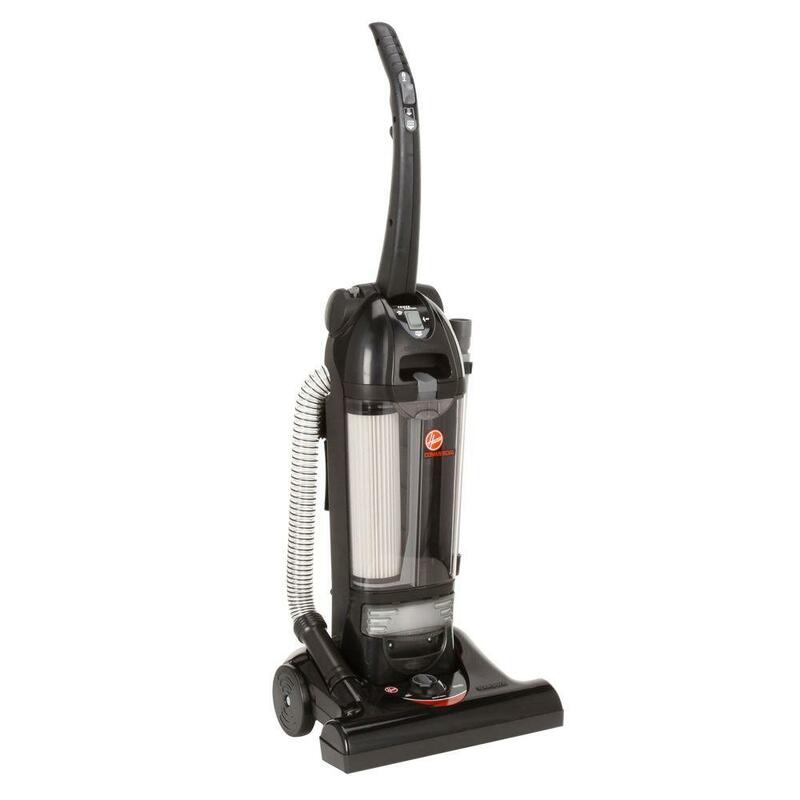 10 amp motor, 135 CFM motor, sealed HEPA means 100% of the air is filtered at a rate of 99.97% at 0.3 microns, easy empty, large dust cup, 13" cleaning path, 40' cord length, 69 dB, cleaning tools include wand, crevice tool and dusting brush, 3:1 stretch hose, true balance, double ball bearing brush roll, Meets LEED requirements, 2- Year warrant parts and labor. Easy to use with onboard tools and lightweight handle. Single motor unit with motor in brush roller base for low handle weight. 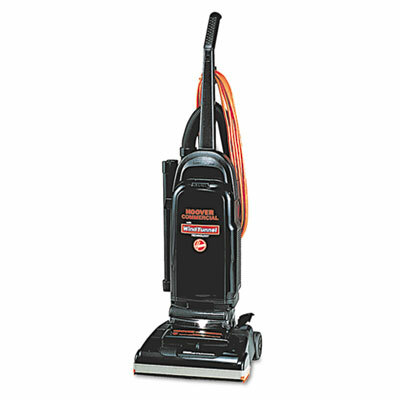 Powerful 1,000 watt motor deep cleans in just one pass. Auto motor shut-off when machine is clogged. 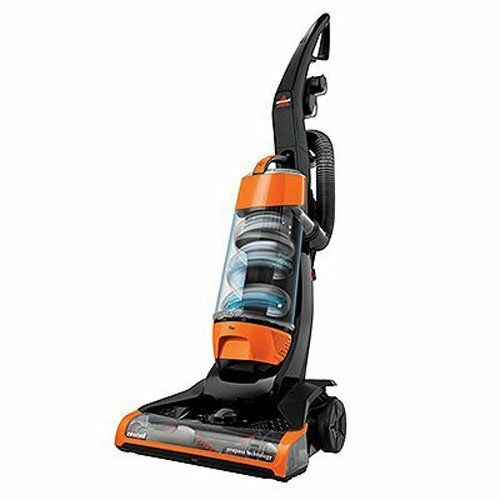 The body is constructed out of high impact ABS and the belt driven brush roller spins at 4,000 rpm. There is a manual brush roller height adjustment with a soft touch ergonomic handle with height adjustment. 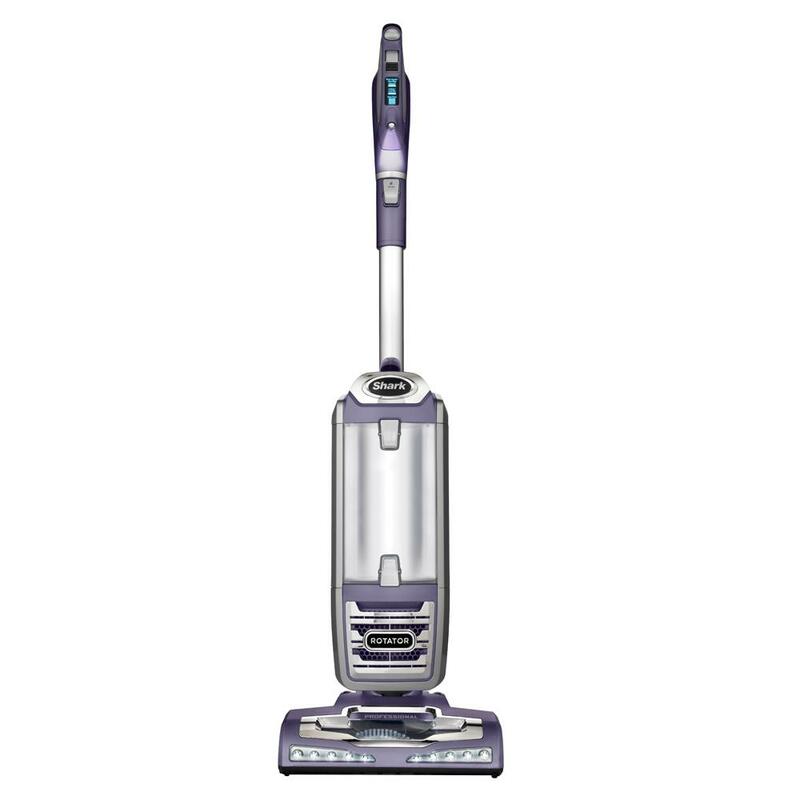 Contains full set of attachment tools that includes an upholstery brush, dusting brush, and crevice tool that is designed to store in back of the vacuum. 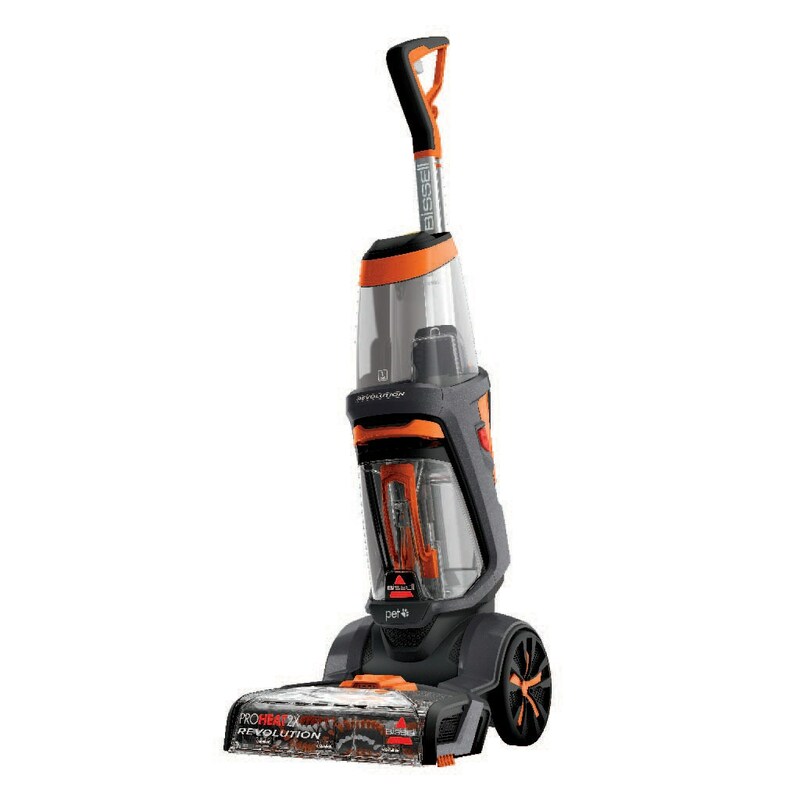 Includes telescopic wand and stretch hose that extends more than 9 feet for convenient above-the-floor cleaning. 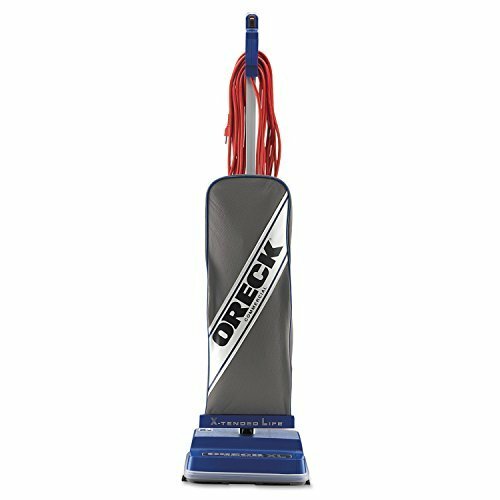 Comes with 40 ft long (quick change, no tools required) power cord with cord strain relief that allows for 80 feet of cleaning area. Comes with 2 year Commercial Warranty. 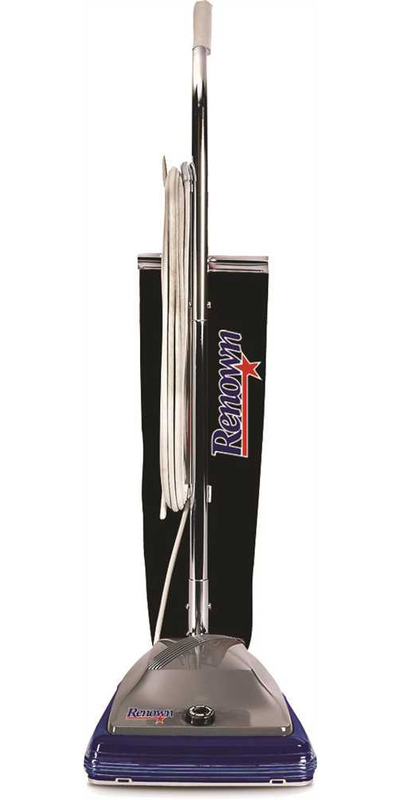 RENOWN� UPRIGHT VACUUM CLEANER, SINGLE MOTOR, 12" RENOWN� UPRIGHT VACUUM CLEANER, SINGLE MOTOR, 12"
Pick up more dirt than you could have imagined. 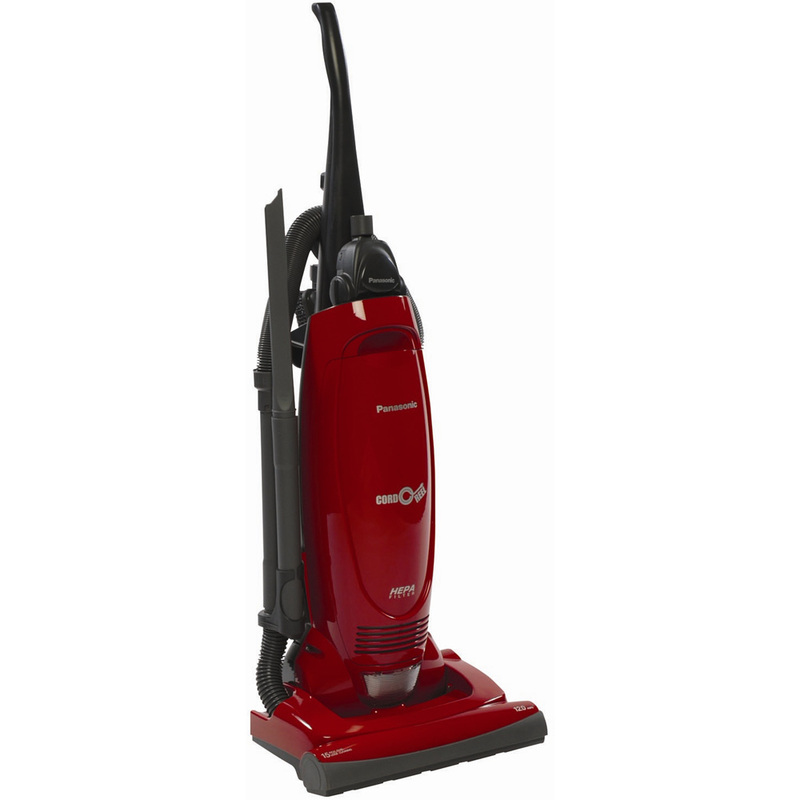 This vacuum cleaner uses WindTunnel� technology to outperform any other clean-air upright. Nine-stage allergen filtration system works with reusable, easy-change three-layer allergen filter cloth bag that is capable of filtering out 100% of dust mites and their eggs plus 99.98% of ragweed and common grass pollens--an ideal function where high standards of cleanliness must be maintained. The six-piece on-board tool set with super stretch hose can clean a variety of surfaces and hard-to-reach areas. 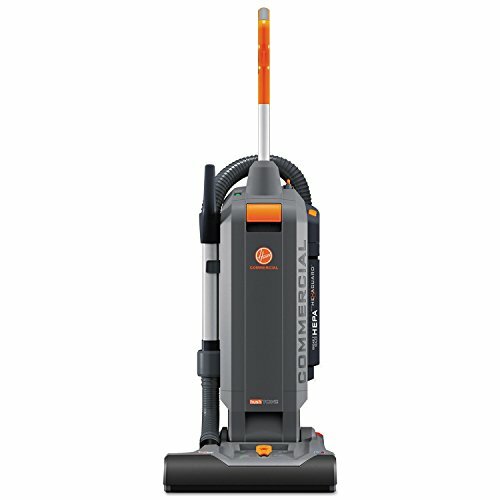 13" cleaning width is great for big jobs, while the up-front carrying handle makes for quick transportation. Has four-position height adjustment and furniture guard. Current: 12 amp; Color(s): Black; Weight: 15.2 lbs; Cleaning Path: 13". Lightweight 12 Lb. 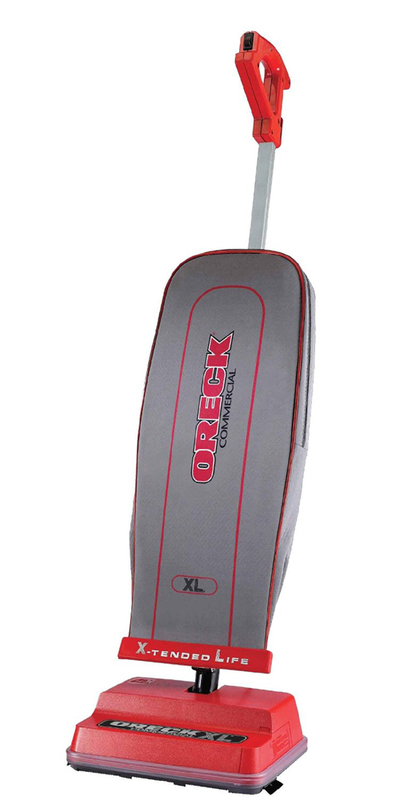 Upright Vacuum For Heavy-Duty Cleaning. 30' Power Cord. 4 Position Carpet Height Adjustment. Chrome Steel Handle. Furniture Guard. Heavy Duty Shake Out Dust Bag. Wooden Brush Roller. 1 Year Warranty. 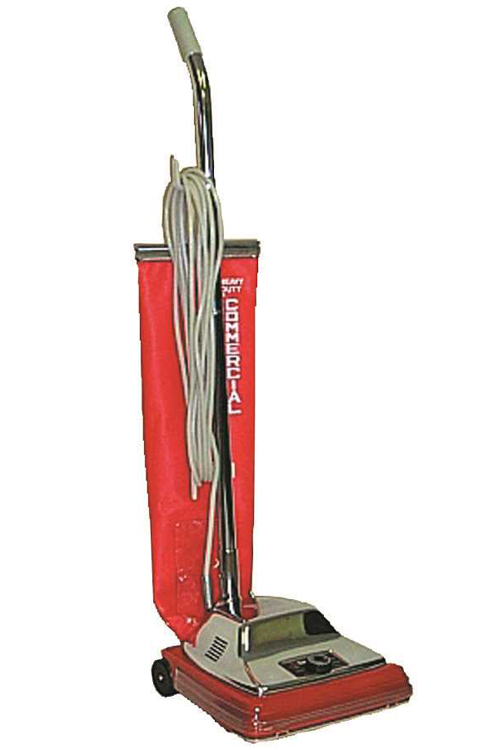 Keeping carpets dirt-free is easier with this commercial vacuum cleaner. 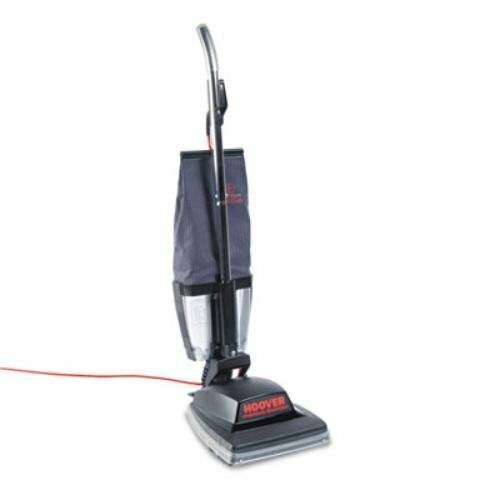 It has a six-position height adjustment for more efficient vacuuming of all kinds of carpeting!^^Features|Cloth Shake-Out Dust Bag|Chrome Steel Handle|50-Foot Power Cord|Vibra-Groomer II� Brush Roller|Quick Kleen� Fan Chamber|Chrome Hood^^Specifications|Motor Amps: 7|CFM: 145|Width: 12"^^Warranty Information^This commercial vacuum cleaner is protected by a warranty. The warranty is good for one year. 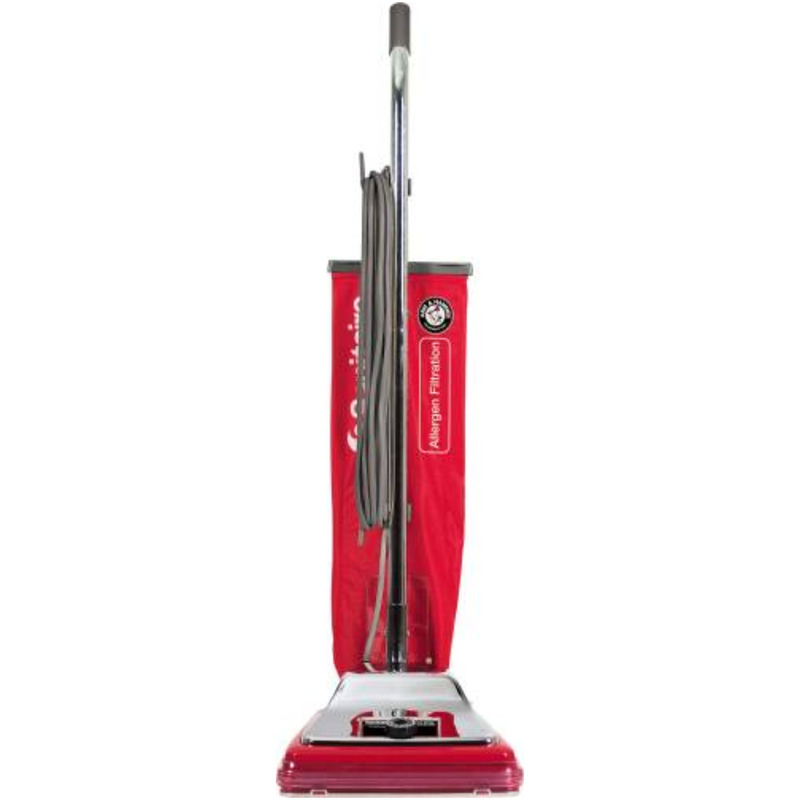 Whole House Elite Dual-Cyclonic Upright. This item cannot be shipped to APO/FPO addresses. Please accept our apologies. 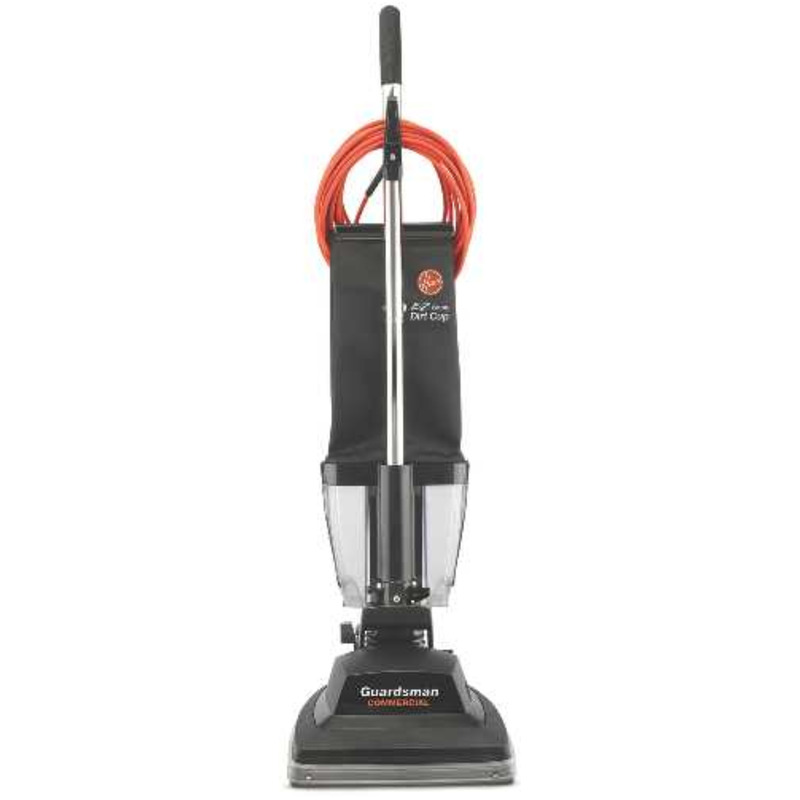 SANITAIRE VIBRA-GROOMER 1 VACUUM, 16 IN. 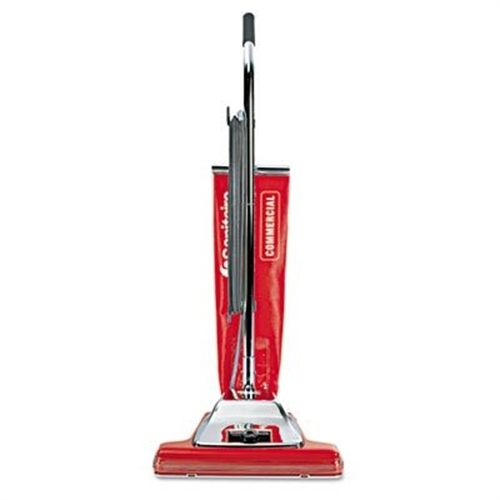 SANITAIRE VIBRA-GROOMER 1 VACUUM, 16 IN. 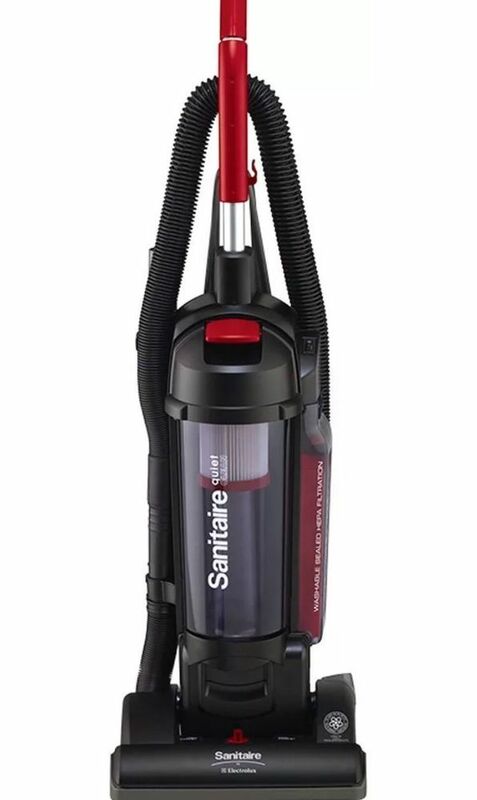 The Sanitaire SC899 commercial vacuum cleaner features an extra-wide 16-inch cleaning path plus Sanitaire's Quick Kleen fan chamber and shake-out bag system for fast cleaning and easy maintenance. 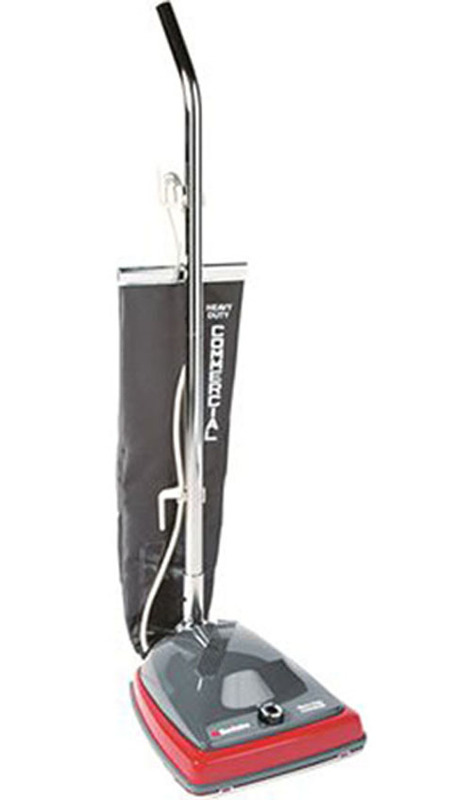 This heavy duty vacuum cleaner is ideal for hotel, education, government and building services applications. 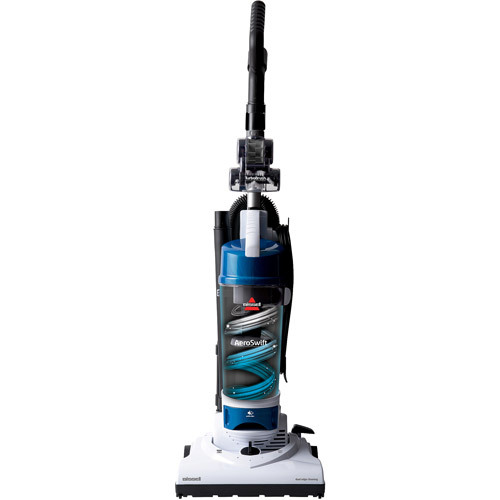 It comes with a 7 AMP Suction Motor, 16 inch all metal VGI Beater Bar Brushroll, 50 foot cord, and six-position height adjustment. Red. 1 each.